While the idea of getting the house organized has long been associated with “spring cleaning”, the truth is, summer is the season when it’s more likely to happen. For many families, it’s because the kids are home, some having returned from distant places only for a few months, some simply with more time on their hands now that the school year has ended. And while they might be thinking summer is all about vacation, you know it’s prime time for some good old-fashioned organizing. Whether it’s a one (wo)man job or a family affair, the long summer days and warmer weather signal the time to embark on a thorough review of the household contents. 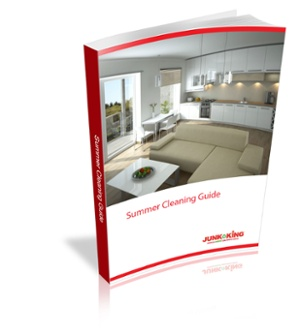 Whatever the motivation for your summer cleaning, one thing is clear: summer cleaning can be a daunting task. We suggest you begin with one room, or even just one closet. A big decluttering weekend can be a great way to make progress, but carving out such a large chunk of time may not be easy to arrange — and if you keep putting off getting started because you’re waiting for a big space to open up on your calendar, you could be waiting a very long time. The first piece of advice: Get over sunk costs. In the world of economics, costs that have already been incurred and can’t be recovered are known as sunk costs. As you go through the items in your house, most things should be considered sunk costs (except the rare item that may have increased in value). Since you’ll never get the money back that you spent on that item, you should only think about the value that thing can add to your life in the future. Understanding this concept of sunk costs can help you make more rational decisions about what to keep and what you should toss. Step #1: Designate categories for items in each room, and the garage. Step #2: Purchase storage bins and sticky labels. Step #3: Identify the local charities that accept donations, the location of the hazardous waste collection center, and the nearest medication collection center. First things first --Set a timer and turn on the music! We recommend that all cleaning and organizing should be done during a specified amount of time, and always to music. So once you’ve decided how much time you’ll devote to the task of kitchen organizing – depending on the size of the kitchen and the amount of clutter you’ve accumulated – set the timer, then make sure to turn up the volume on some great tunes. Now you’re ready for the fun to begin. Then place them in a central location. Designate one for trash and one for donations, and if you’re feeling truly inspired – one for a garage sale or for items you’ll sell online. Did you know these have expiration dates? Yes they do! Unload every single tiny jar and package onto the kitchen counter, and check the expiration dates for every single one. Use that handy transparent bin to discard those that are expired, and any others that you haven’t used in the last year. For the committed recyclers, feel free to dump the contents and throw the jar in your kitchen recycling bin. Do you really need all three of those cute little tea strainers? Is it time to admit that the kids will never again use those squiggly straws? If so, start filling the transparent donation bin with these lovely items that will make the next person happy. Most likely, these aren’t the types of items worth keeping for a garage sale – they’re inexpensive to buy from a retail store, so there just isn’t much demand. The question here has to do with how often you entertain, the kinds of beverages you drink on a daily basis and on special occasions, and on how much storage space you have available. While most families don’t need more than two of each type of glass per family member, and no more than a couple of mugs for each person, no one wants to be short of glasses when guests arrive. Set the timer, then make sure to turn up the volume on some great tunes. Now you’re ready for the fun to begin. If you entertain only occasionally, consider buying a storage container made specifically for glassware. You can then keep the glassware you use regularly in the kitchen, and the rest in a separate storage space. But that old chipped coffee mug bearing the logo of the company you worked for 10 years ago? That one needs to go. A tidy pantry is a cook’s best friend. Throw out any expired foods, and consider dropping usable non-perishables you’re willing to part with at the local food bank. Then restock the shelves by type of products – canned foods on one shelf, rice and pastas on another, cereals and crackers on another – you get the picture. This is where things can get tough. While some of us are dedicated juicers for example, others not so much. We know we should keep that juicer around just in case, but let’s be real folks. If you’ve had any appliance or gadget hidden away in the cabinet for “one of these days”… it’s probably time to let it go. The good news is, these are popular garage sale, secondhand store or online sales items, so either put them in the bin marked “sales” for now, or just send them away, and let that feeling of weightlessness begin! Only keep frequently used, essential small appliances on kitchen countertops – the rest should be put away or donated if you never really use them. Again, the rule of thumb is the number of times these have been used recently. If you haven’t needed a recipe from a cookbook for more than a year, it’s time to let them go. And if you’re having a hard time parting with all of those copies of Gourmet collecting dust on the shelf, remember that almost every recipe ever written can be found online now. Plus, used book stores will be happy to pay you for your useable cookbooks and magazines, which might provide the motivation you need to pack them up and let them go. Alternately, consider choosing a few of the magazine covers to gently remove, then place in a nice frame. They make great prints for decorating kitchen walls. Most everyday cooks really only need about 4 or 5 pans of different sizes, and about the same for pots. While grandma’s rusty dutch oven might have some sentimental value, this isn’t an episode of American Pickers. This is your kitchen, and it might be time to accept that you’ve go to throw it out, or at least add it to the donation bin. Most everyday cooks really only need about 4 or 5 pans of different sizes, and about the same for pots. Many of us like to have a large roasting pan available for holiday cooking, but if you have space in the garage, it might be better off there. We suggest keeping only one of each item. You don’t need five different countertop cleaners. Keep one and get rid of the others that you don’t use. Pare down cleaning rags and other miscellaneous items. Keep it simple! For example, do you make coffee every morning? If so, put your coffee cups in the cabinet closest to the coffee maker for efficiency. Do you use a specific pot or pan most regularly? Then store it in a cabinet closest to the stove, or consider installing a hanging rack above it, where you can hang your most commonly used pots and pans. Okay! Now that you’ve de-cluttered and restocked the kitchen cabinets, it’s time to take your bins (and portable speaker) and move the party to the next room. One of the most satisfying and generous ways of putting your unwanted toiletry items and bath supplies to better use is by donating them to a homeless shelter or other human services organization. Another possibility is to simply place items in a backpack you no longer need and offer them directly to someone who might need them. A nice lotion, shampoo, or bar of soap could make a big difference in the day of someone who’s struggling. Bring the bins to the bathroom! Once you have your labelled bins in place, start by clearing out the entire contents of your bathroom cabinets and place all of the items on the counter or a nearby table. Check for expiration dates, and if they’re expired, you can throw them away IF they don’t contain hazardous chemicals. Some bathroom cleaning products do contain these chemicals and if any of your soon-to-be discarded cleaners do, start a new bin for hazardous waste -- there will likely be more items to come. According to the U.S. Food and Drug Administration, almost all medicines can be thrown into your trash bin. These include prescription and over-the-counter (OTC) drugs in pills, liquids, drops, patches, creams, and inhalers. However, if you’d rather dispose of them in a different way, The U.S. Drug Enforcement Administration (DEA) sponsors National Prescription Drug Take Back Day in communities nationwide. Many communities also have their own drug take back programs. Check with your local law enforcement officials to find a location near you or with the DEA to find a DEA-authorized collector in your community. Have too many half-used bottles of shampoo? Combine them! The truth is, all shampoos contain similar ingredients to clean your hair. Known as surfactants, they are the same compounds used in many other cleaning products. Combining them will save some space in the cabinet, and allow you to recycle the empty containers. Just as in the kitchen, you don’t need five different bathroom cleaners. Keep one and get rid of the others that you don’t use. Keep it simple! It’s easy to let the living room get a little too “lived in”, and start to look like an outsized closet. If your living room has become the home to all of your books, magazines, and technology, it might be time to do some de-cluttering here too. Take a good survey of your living room, making note of the furniture. Find one piece that’s not being used or isn’t really needed and make a plan to get rid of it. If you plan to give it away, try to drive it to a donation center today. If you want to sell it, place an ad or bring it to a consignment shop today. Don’t wait! Next, gather up any magazines more than a year old and throw them into your recycling bin. Is it time to donate some books? If so, put them in the donation bin, or maybe the “sell” bin if you have a nearby used book store that might offer you a little spending money in exchange for them! Same with the CDs and DVDs that haven’t been used for a while. Gather up any magazines more than a year old and throw them into your recycling bin. Is it time to donate some books? Clear off flat surfaces. Flat surfaces are clutter-magnets. If you need to keep a few things on the side tables or the coffee table, that’s OK, but make it a goal to free your flat surfaces of most clutter. By now, you’ve got the plan down. You have your bins ready and your purging juices are flowing freely. You might have even created your own mix of the 10 most motivating house cleaning songs. Keep it up – you’re making great progress! You get the gist. Hold yourself to a strict rule for which clothes you’ll keep, which you’ll donate, and which you’ll save for a garage sale, consignment shop, or online sale. Remember, when we clear out the clothing that doesn't fit, doesn't serve us, or isn't truly reflective of our personal style TODAY, we create a space filled with more possibility, creativity, and freedom. When you’re sorting, consider how you feel about each piece of clothing. Hold yourself to a strict rule for which clothes you’ll keep, which you’ll donate, and which you’ll save for a garage sale, consignment shop, or online sale. Of course! These items work for you, fit you, and are aligned with your style. These pieces seem like something you love, but there's something a little off about them. Maybe there's a fit issue or you just don't have anything that goes with it. But if it doesn't fit well and you don't feel committed enough to have it altered, get it out of there. Donate: These are pieces you need to ditch. They are either old, worn, fit weird, or stained. Be ruthless -- If it looks tattered or old—goodbye. If you haven't worn it in a year or more (unless it's a costume) toss it. You can also put things in a purgatory pile if you're not sure. Leave the pile alone for a week and see how you feel after you've had a chance to live without it. Sell: These are nicer, less worn items, but just aren't for you anymore. You can sell these online or locally at a consignment shop. Bag up or throw your donate/sell items into a bin. If you're worried you'll have second thoughts, just put them in the garage or something, or in your car to bring to the donation spot. It's such a great feeling to have freedom from what you don't need anymore, getting the stuff out of there will really help the process feel complete. After you’ve sorted your clothing, do the same with all of your accessories. Lay them out, sort them out, and place them in their bins. You’re on a roll! Consider purchasing an umbrella stand as a place to store not only your umbrella but other odd items like a yoga mat. Use boxes, cubbies, tiered shelves, or a hanging organizer to sort shoes and accessories. Use stackable laundry baskets for easy sorting. Hooks can create extra storage space when you hang them inside the closet. Make more room in your closet by storing out-of-season clothes in boxes up high or under the bed. The first step is to go through all of the toys. It’s better to be pretty ruthless with de-cluttering the toys. Anything broken, missing pieces, or anything that has not been played with in a few months should go to the trash bin. Next, as in the master bedroom, empty the dresser drawers and closet, and place all of the clothing on the bed. With kids’ clothes, it’s much easier to identify the clothes you can donate, since they’re often just too small to be worn anymore. Keep loading up that donation bin, and notice how good it feels to create space! Finally, organize the toys you’re going to keep. If you don’t have one already, consider a toy box for the larger toys, and smaller bins, either in a freestanding shelf or shelving unit that fists in the closet. Separate the smaller toys inside those. With school out of session, clear out backpacks, school papers, drawings and activity bags. Let your child help to decide what to keep and what to toss. Also be sure to sell back textbooks if that’s an option. This step may require literally clearing the driveway and using it as a staging area for separating all your things. Place frequently used items, like bikes, close to the garage door. Consider purchasing large wall hooks to hang them on. One of the best methods of organizing and using the garage space efficiently, of course, is to install shelving. Simply putting everything that fits into plastic storage containers, for example, is a good start, but these can only be stacked so high before creating a different hazard. Storing everything on shelves is a far safer and more efficient method. The goal is to store "up", not all over, and shelving can make this happen. A great thing about a residential garage is that it can support a variety of shelving methods. And the space used for shelves is only limited by the height of the ceiling, the number of doors taking up wall space, and the methods used. If your piles are large, you might consider calling a professional junk hauling firm like Junk King to take both your recyclable items as well as the "junk" items. Junk King believes in recycling every bit of material possible. One of the best things about hiring Junk King is that we recycle much of the material we pick up. This is proof of our commitment to being an eco-friendly removal service. If you have questions about what we do or what we believe, give us a call at 1-888-888-JUNK (5865) or book your junk removal service online - right now! Download this Guide and Take it With You! Simply Click the image above and we'll email it to you! Save our Summer Cleaning Guide on your computer or share with your colleagues!